Aldon J “Lefty” Wilkie was born on October 30, 1914 in Zealandia, Saskatchewan, Canada. In high school, he won letters in ice hockey, baseball, basketball, and football, and signed a professional contract with the Tacoma Tigers of the Western International League in 1937. The 22-year-old Wilkie was 15-13 his rookie year with a 3.91 ERA. In his first game he pitched a shutout for seven innings against Vancouver. In 1938, Wilkie joined the San Francisco Seals of the Pacific Coast League as a relief pitcher. He finished the year with a 1-8 record but a respectable 3.93 ERA. Wilkie was 3-1 with the Seals in 1939 and joined the Seattle Rainiers in 1940 where he returned to the starting rotation with an excellent 13-5 record and 2.69 ERA. Following his success with the Rainiers the Pittsburgh Pirates purchased his contract in August 1940 and he joined the National League club the next season making his debut on April 22, 1941 against the Cardinals. Wilkie finished the year with a 2-4 record and 4.56 ERA in 26 appearances. 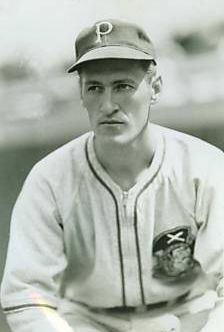 In 1942, Wilkie was 6-7 in 35 appearances with the Pirates. During the off-season he worked at a shipyard in Oregon and decided to remain in his defense job when the 1943 season came around. In May 1943, baseball placed Wilkie on the Voluntarily Retired list but in July he was ordered to report for military service with the Army. Private Wilkie was stationed at Camp Roberts, California in 1944 and was sent overseas with the 36th Infantry Division in 1945. He was in Mannheim, Germany at the end of the war and compiled a 23-3 record pitching with Army teams. When Wilkie returned from military service in 1946 he made seven unsuccessful appearances with the Pirates before he was sent to the Hollywood Stars of the Pacific Coast League where he compiled a 9-7 record. Wilkie – 32 – joined the Oakland Oaks in 1947 and moved on to Kansas City of the American Association in 1949. He returned to the Western International League in 1950, pitching for the Victoria Athletics then the Salem Senators in 1951. Wilkie retired the following year raising chickens at his farm in Newberg, Oregon and serving for many years as a poultry show judge. Aldon Wilkie passed away on August 5, 1992 at Tualatin, Oregon. He was 77.